The Vice President in charge of Information Communication Technology (ICT) who doubles as the Provost of Abuja Chamber of Commerce and Industry (ACCI) training arm known as Business Entrepreneurial Skills and Technology (BEST) Centre, Prof. Adesoji Adesugba has felicitated with Alhaji Sanusi Maijamaa Ijiya over the award of Outstanding Personality Award he received yesterday. Prof. Adesugba is also the Publisher and Chief Executive Officer of Chamber Telegraph. 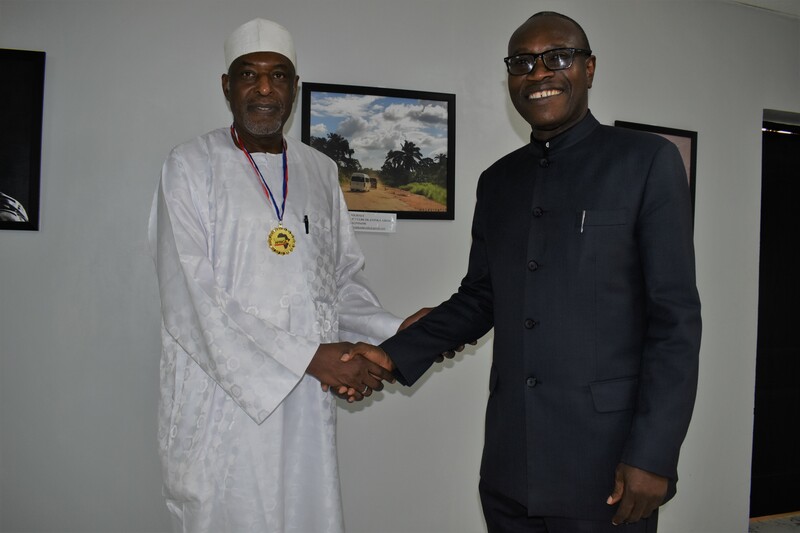 Alhaji Maijamaa who is the National Vice President of the Nigerian Association of Chambers of Commerce, Industry, Mines and Agriculture (NACCIMA) was bestowed with the award by the Trans Africa Students Initiative (Transi Africa). In a congratulatory message during an interaction with Chamber Telegraph, Prof. Adesugba stated that the exemplary life exhibited by competence, professional mastery, simplicity, courage and patriotic zeal has made him the best person for the award out of several other Nigerians. “I have watched the career progression of Alhaji Maijamaa for some time and I can tell you that he is detail in everything he does. He is a man with a rare Midas touch, master of his profession, an accomplished and truly detribalised Nigeria who has contributed greatly to the growth and development of the Nigerian economy. “In the NACCIMA where he is a National Vice President, he has contributed vibrant ideas and commitment towards ensuring that Nigeria’s economy is placed on a sound footing consequent upon which jobs and wealth will be created for the greater good of Nigerian youths. “Most importantly, I share the same passion of bringing up Nigerian youths up in a manner that will take them away from illicit practices such as drugs abuse and cultism. I am happy that he was singled out for this recognition from young men Pan African students. This means these young African have recognised the role the founding fathers of Africa played in shaping the lives of great Nigerians like Alhaji Maijamaa”, Prof. Adesugba emphasised. Prof. Adesugba used the occasion to explain the on-going training known as #BEST1000 Nigerian youths who are (to be) trained in different vocational skills programmes in 2019 stating that, already the first batch of 120 trainees have graduated across ICT vocational areas such as digital marketing, photography, website development/administration, graphics design and other ICT support services. He announced that, in the next phase of training, the Trans Africa Students will be given 5-slots to enrol their members, a gesture which received a standing ovation from them. Earlier in his presentation, the leader of the Pan-African driven initiative delegation, Musa Abdulrauf said, Alhaji Maijamaa was chosen from the pool of other Nigerians for his commitment to the development of the country, dedication to duty, selfless service, Midas touch, quintessential qualities amongst others. “Permit me on behalf of the entirety of students under the coverage of Trans Africa Students’ Initiative to welcome each and everyone here to this dignified occasion of conferring honor on a man of honor, an intellectual juggernaut, an humanist with a Midas touch, a quintessential icon, a legal luminary, a seasoned administrator with top-notch managerial skill set, a man of outstanding understanding and a role model and mentor to African students in the person of Alh. Sanusi Maijamaa Ajiya”. “Amongst many other reasons, this is why we would always associate ourselves with you and many other individuals and organizations who have singled themselves out in positive contributions to our continent, we in turn shall always be in the vanguard of projecting and engaging in activities that would bring pride and honor to everyone that is associated with us as members, ambassadors, patrons or matrons, we shall find salient point, areas of partnership with your distinguished personality especially with regards to capacity building of students of Africa, in germane would improve our educational, psychological, socio-economic pursuits”.